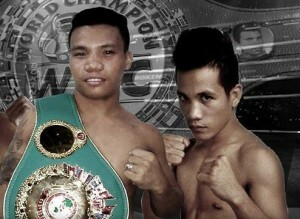 FORMER Oriental and Pacific Boxing Federation (OPBF) flyweight champion Ardin “The Jackal” Diale and current WBC Eurasia Pacific Boxing Council light flyweight champion Michael “Blade” Enriquez will fight for the vacant WBC International super flyweight crown on December 3 in Puerto Princesa City in Palawan. It will be promoted by Japanese international promoter Ryuta Kato of the United Boxing Promotion with Warren Evison as the matchmaker. Games and Amusements Board (GAB) Chairman Abraham “Baham” Mitra is gracing the event. Diale is toting 31 wins, 10 losses, 4 draws with 15 knockouts while Enriquez has 12 wins with 8 knockouts against 5 losses and 1 draw. The 28-year old Diale, a native of Malungon, Sarangani Province previously fought for the interim OPBF super flyweight title against undefeated Ryan “The Fire Fists” Lumacad last Sept. 30 in Bacoor, Cavite. But the fight ended up in a technical draw in the 4th round after Diale suffered a deep cut on his left eyebrow to an accidental headbutt. Diale won the vacant OPBF flyweight title by a unanimous decision against Renoel Pael last 2015. He retained it in his first title-defense by a UD against challenger Jonathan Francisco last February 20. But Diale as knocked out in the 4th round by Japanese challenger Daigo Higa in his second title defense on July 20 in Tokyo, Japan. “Kaya ko pang maging champion muli. Sisiguruhin kong makukuha ko ang korona sa Palawan,” (I can still be a champion again. I will make sure that I will get the crown in Palawan.) said Diale. Diale is also a former Philippine flyweight, IBF Pan Pacific Youth flyweight and WBO Oriental flyweight champion. Enriquez, a native of Balingasag, Misamis Oriental, previously scored a 1st round knockout win against Rowel Garcia last June 26 at the Gaisano Mall of General Santos City. He lost by a majority decision to Donny Mabao for the vacant Philippine flyweight crown last February 20 in Taguig City. The 25-year old Enriquez also fought but lost in three other international championships. Enriquez bowed by a split decision to Jake Borea for the vacant WBF International flyweight title last January 14, 2014 in Gensan. He then lost by a retirement in the 5th round to Mzuvukile Magwaca for the vacant IBO Inter-Continental flyweight title on June 6, 2014 in Eastern Cape, South Africa.